A wedding theme is a helpful way to make sure the special occasion looks the best it possibly can and also showcase the couples personality and style. The Function Junction outlines the hottest new wedding themes below for 2017-2018 and beyond, with of course, music ideas for live bands and DJ's to suit each one. As Pantone announced that the zesty shade ‘Greenery’ is the colour of year, green has become a major wedding theme trend. Pantone says the hue is “a refreshing and revitalising shade, symbolic of new beginnings”, making it a wonderful fit for weddings. Woodland weddings with a forest theme have the colour green as a focus and also florists have seen a rising trend for couples choosing more foliage for their table centrepieces and bouquets and opting to have less flowers - also helping keep the budget side of things down. Music to match: The clue is in the name, Alyson Green is a professional jazz singer with a huge repertoire drawing on the great “standards” of the 30s, 40s and 50s. As ‘The Little Mermaid’ live action film is soon to be released this summer 2017 (based on the Hans Christian Andersen fairytale not the Disney version), Pinterest has become awash with couples showing off their subtle yet whimsical under-water themed weddings. Shimmering mother of pearl, muted sea blues and corals are chosen as the main colour references, delivering a unexpectedly vintage chic twist to a wedding. Can’t imagine it working? The wedding stylist Hannah Taylor shows you how. Music to match: An under-water theme needs to be paired with dreamy and relaxing music. Harpist Alice Trentham will create the perfect atmosphere with her stunning sounds, ideal for the wedding ceremony or drinks reception. In a backlash to the typical countryside wedding, the industrial wedding trend is also becoming increasingly popular. Happy couples are picking huge brick warehouses or city settings as their venues instead, and prefer breath-taking skyscraper backgrounds to rolling green country hills. Balance the harder materials, minimal setting and a darker backdrop that a warehouse can bring, with amazing lighting such as fashionable Einstein light fixtures, plenty of of soft bunched flowers, green foliage and warm copper accents. Music to match: Keep it digital and hire a DJ for your industrial themed wedding. Click here to see our DJ selection and hire. Ever since the Great Gatsby film re-make the 1920’s has been a big wedding trend, and it’s set to continue well into 2018. Instead of the stereotypical black and gold 1920’s colour theme, there is a call for a much more sophisticated and lighter colour palette. Brides are choosing vintage-style dresses with scalloped edging and intricate silver beading and using family heirlooms as jewellery or wedding props. 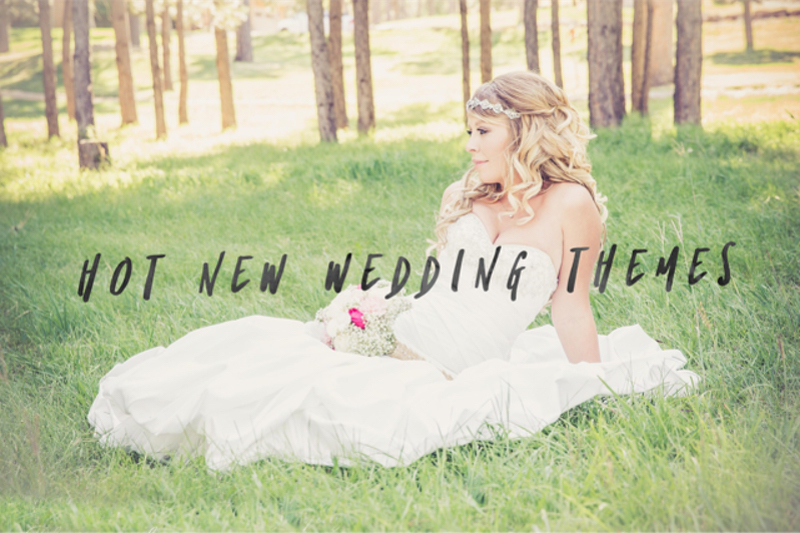 For more tips on how to throw a vintage wedding, read our blog post for more details. Music to match: Portobello are a fantastic vocal harmony group specialising in modern pop songs and swing & jazz standards all performed with a vintage twist. Bright colours are back in a big way for 2017-2018 weddings, but with a difference. Instead of choosing a cacophony of colour for the wedding theme, modern couples are sticking to a palette of neutral colours such as white, ivory and cream and pairing them with a punch of one or two contrasting colours, like bright poppy red, zesty yellow, vivid green or vibrant turquoise. Colour blocking is set to be a huge trend this year in fashion, so look to fashion designers recent collections including Valentino, Armani and Gucci for inspiration. Music to match: An ultra-fashionable wedding needs a sophisticated live band to match. Molly and the Easy Beats will definitely bring a classy vibe to a wedding.